The British postal system was the Royal Mail because it was originally used only for sending royal and government communications. In 1635 Charles I made the service available to the general public, but 200 years later the system was an archaic, expensive mess, from which it was rescued by Rowland Hill. A schoolmaster in Birmingham originally, Hill was later involved in the creation of the colony of South Australia. In 1837 he wrote a pamphlet on post office reform and sent it to Thomas Spring Rice, the chancellor of the exchequer in Lord Melbourne’s government, who was impressed. At that time letters were paid for by the recipient and the price varied according to the distance travelled and the number of sheets of paper involved. It was costly and there is an engaging story that Hill’s interest in the postal system was inspired by seeing a young woman upset because she was too poor to pay for a letter from her fiancé. He suggested that each letter should be paid for by the sender and should cost the same to every town with a delivery office, regardless of how far it had travelled. Delivery to rural addresses would cost extra (as it would until 1897). The post office bureaucrats dug in against any change to their system and Hill’s plans were denounced as ‘wild and visionary schemes’, but there was considerable general support for them, the government insisted and Parliament agreed. Hill was put in charge and the post office announced that sheets of adhesive stamps costing one penny each would be issued and letters would cost a penny per half ounce when posted or two pence if paid for on delivery. The first Penny Black stamps, with a profile of the young Queen Victoria’s head on them, were issued at the beginning of May. Later they were perforated to make them easier to detach from the sheet. Each sheet, containing 240 stamps, cost £1. 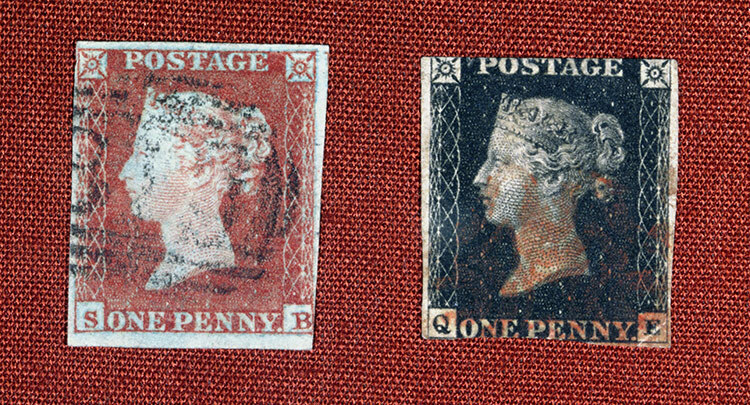 Close to 70 million of the Penny Black stamps were produced before they were replaced a year later in 1841 by Penny Reds. They are now collectors’ items. Hill was dismissed by a Tory government in 1842 amid much cantankerous wrangling, but returned to the post office again from 1846 to 1864. His reforms made sending letters far cheaper. The poet William Wordsworth complained that he now had to cope with more time-wasting letters from strangers but, along with growing public literacy, Hill’s reforms caused a massive increase in use of the post. He was knighted in 1860 and when he died in 1874 at the age of 83 was buried in Westminster Abbey.